SAD NEWS | Carol Sheldon writes books exploring times-past through mystery, love, betrayal and murder. 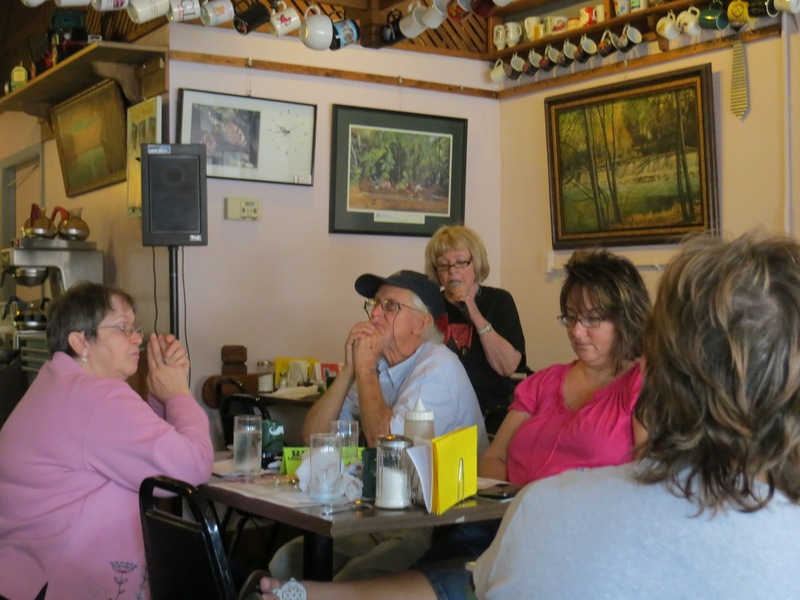 A book reading at Stuart’s brother’s restaurant, Aug. 2013. My dear friend, Stuart Chappell, whom I’ve mentioned on this blog several times passed away recently. It has been a difficult time for me, and of course for his family. Today I wrote this poem for him. He did not go easily to his end. I will not let you catch me. Took them all back to the mountain. who knew it all—his dreams, his fears, his secrets. He’d barely arrived when the whisper of Death whistled through his walls. He planted a garden in the spring, anyway. Nobody with this cancer lives more than a year, they say. Doctor calls him his poster-boy. He builds a pen for new goats. Death’s howl, he’s getting closer? Plans a trip. Buys new luggage. That means he’s going to live, doesn’t it? Look ahead, never behind. Death might catch up. Sick on our trip. So sick. Back home, tries new chemo cocktail. Surely that will set Death back on his heels. He wrestles with this enemy. Was he bargaining for a reprieve? This entry was posted in Historical Fiction and tagged poetry. Bookmark the permalink. So sorry for your loss, Carol. You have written a beautiful and evocative poem that truly informs us about the character of your friend and the nature of your friendship. May he rest in peace. You sure have pegged Stuart right! Thanks you for your poem. It tippiffies (testifies) Stuart. I will be sharing the poem with friend and family. It will remain a treasure to me. Hi Carol, this is Ute. What a meaningful poem for this important man in your life. I am sorry for your loss, at least you have had this connection and enjoyed each other for a long time. Take care, my friend.